Shirts With Random Triangles: Alabama lands third class of 2016 prospect with commitment of athlete Demetris Robertson. 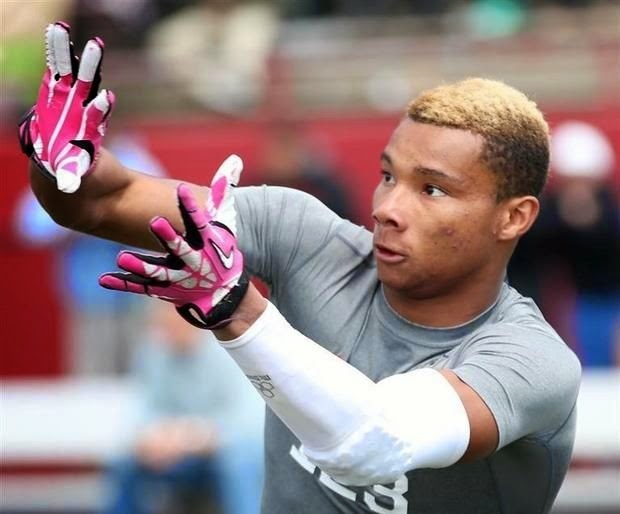 Alabama lands third class of 2016 prospect with commitment of athlete Demetris Robertson. Well, that was quick. No sooner had Alabama gained its second commitment for 2016 from cornerback Shyheim Carter, it added recruit number three to the class of 2016. Savannah, Ga. high school rising junior wide receiver/athlete Demetris Robertson committed to the Crimson Tide on Tuesday. Robertson is ranked as the top athlete prospect for 2016 by 247Sports.com. Robertson is rated as a four-star athlete. He is the fourth-ranked 2016 prospect in the state of Georgia, and ranked 39th among all 2016 prospects. Robertson is ranked 28th in the ESPN Jr 300. Robertson attends Savannah Country Day School in Savannah, Ga. He stands six feet, and weighs 172 pounds.